The inviting interior design of Sofia Future Farm was created purely with the furnishing, as the buildings are strictly protected. 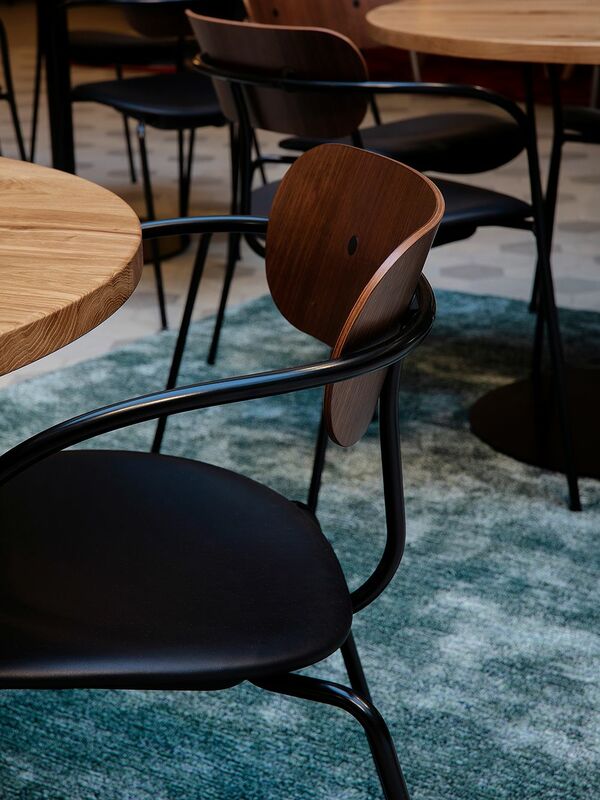 The &Tradition chairs, supplied by Finnish Design Shop’s Contract Sales, combine the different spaces with each other. 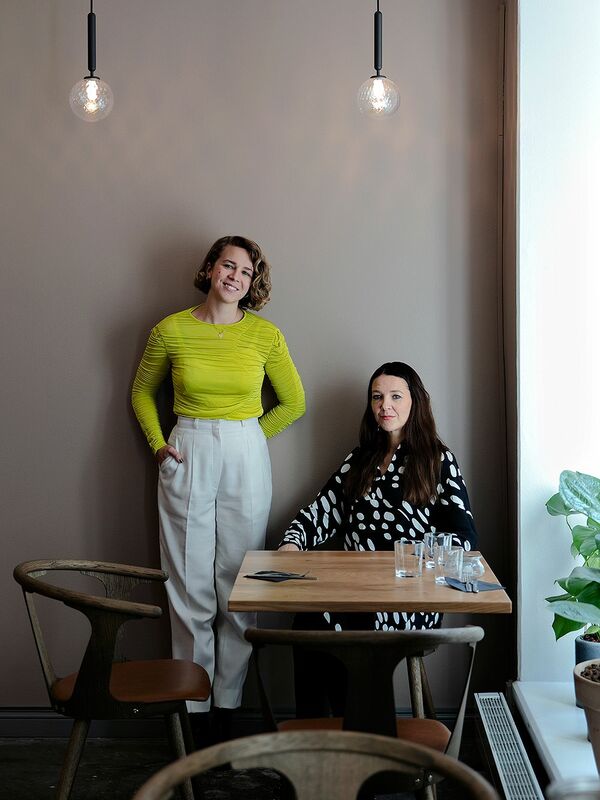 Interior Architect Fanni Suvila from Futudesign and Marketing Manager Vilja Grotenfelt from Sofia Future Farm. 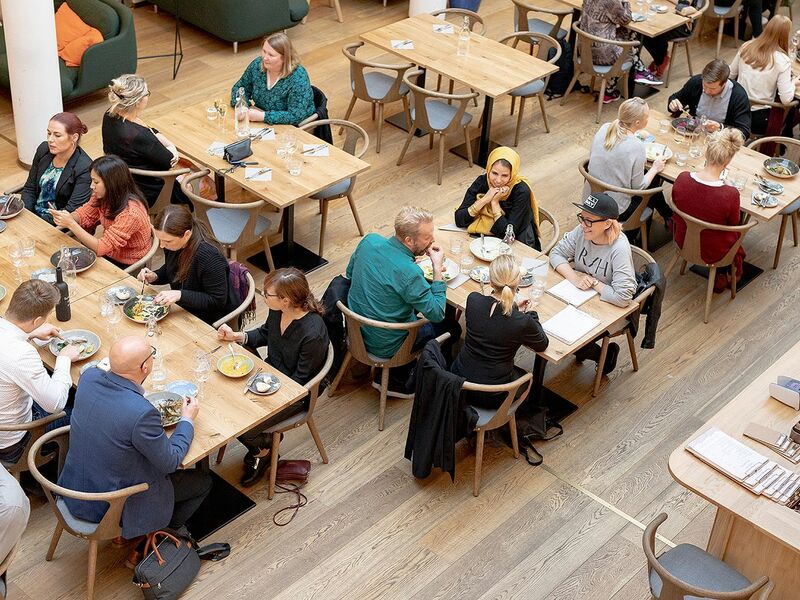 THE &TRADITION PAVILION chairs change places as the Sofia tea salon on Helsinki’s Sofiankatu street is rearranged for a discussion happening in the evening. This time, the theme is societal influencing in business operations. “We might have a dinner for 80 people one evening and a breakfast seminar the following morning. 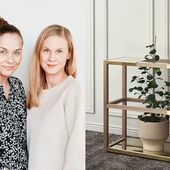 This means that the spaces need to be easily modified,” Marketing Manager Vilja Grotenfelt explains. Discussion events are one part of the operations of Sofia Future Farm, which opened its doors in September. It’s a new center for creative work and urban life: shared workspaces, gigs, a restaurant and a wine bar. The spaces are designed so that the loudest operations are on the street level and the higher you go, the quieter it gets. It’s possible to do yoga or even to take a nap in the wellbeing center on the top floor. “This is a meeting space where people can gather around meaningful things,” Grotenfelt says. She says Sofia Future Farm has role models around the world, but Finland does not yet have a similar concept. Sofia Bistro has been furnished with In Between chairs by &Tradition. Sofia Bistro’s menu focuses on vegetarian dishes and varies by season. 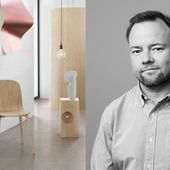 Sami Kallio’s In Between chairs are made of oak. The Sofia Future Farm working spaces can be accessed by purchasing a membership. The tea salon and the entire downstairs with its restaurants are public spaces. This way, all city residents have access to the building that was designed by Lars Sonck in 1913. Until the 1930s, the building functioned as an additional part of Stockmann. The area where the tea salon and working spaces are now used to be the department store’s hardware and antiques department. 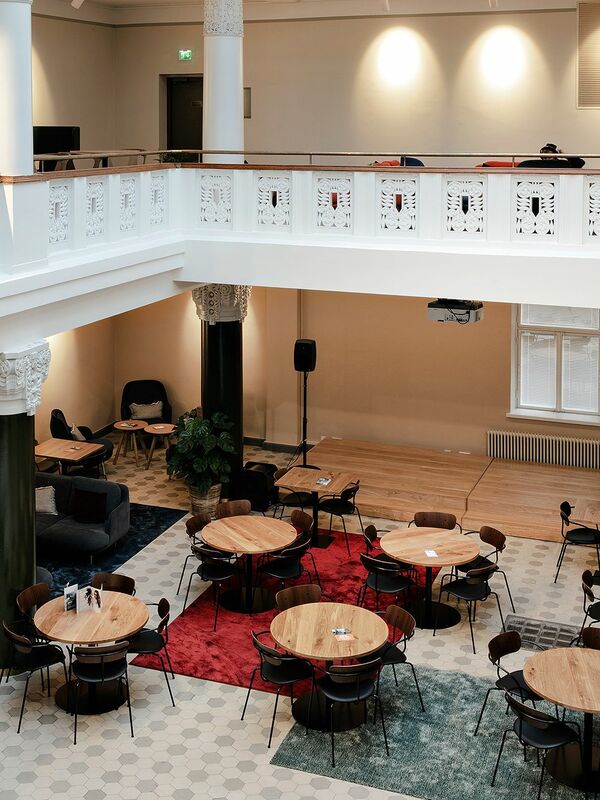 After Stockmann, the space has been in office use and the latest user was the Helsinki City Museum. Sofia Future Farm also uses a part of the next-door Kiseleff House, designed by Carl Ludvig Engel in 1818. Both buildings are protected by the Finnish Heritage Agency. This set a tight framework for the interior design that Futudesign designed. “It was clear from the very start that we were there just to design the furnishing. 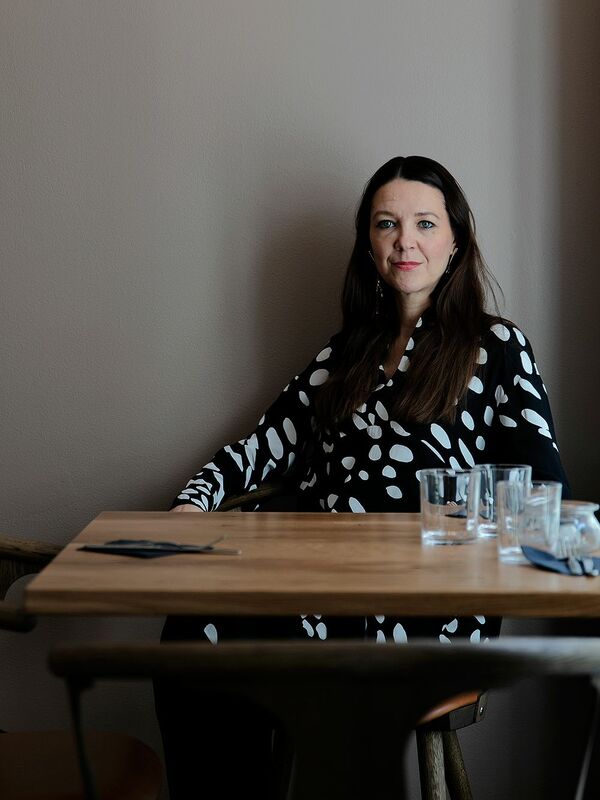 However, it’s easy to be inspired by amazing buildings,” Interior Architect Fanni Suvila says. For example, the wall tones in the Kiseleff House upstairs’ cabinets are picked from small model squares that were left in the rooms to describe the original colors. The final paint tones had to be chosen from limited paint color charts and approved by the Finnish Heritage Agency. Even this was not a problem, on the contrary, according to Suvila. “It was clear that the furniture needs to be high-quality and elegant”, Fanni Suvila says. Also the bar chairs are from the In Between collection. 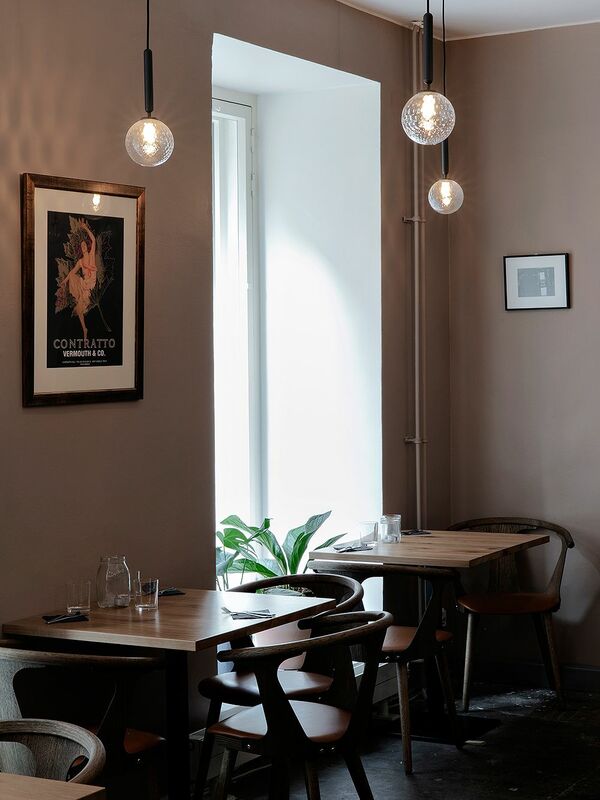 Designed by Sofie Refer for Nuura, the Miira 1 pendants light up the wine bar. &Tradition’s awarded Pavilion chairs by Anderssen & Voll have been chosen for the tea salon. 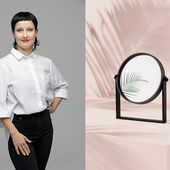 As it was prohibited to touch the surfaces of the historical buildings, the furniture had an exceptionally decisive role. The furniture creates a joint atmosphere in the premises’ 3,000 square meters. 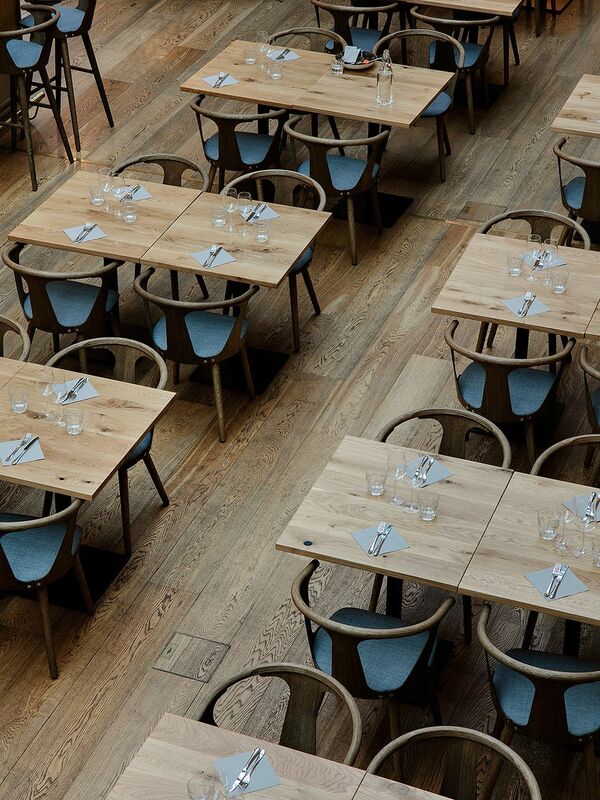 “There is an enormous number of chairs and tables, so they bring the different spaces together,” Suvila says. 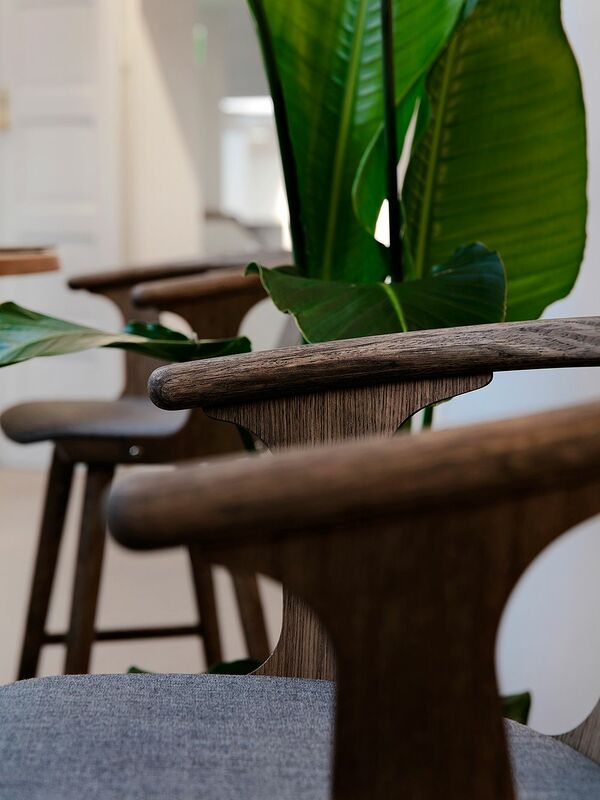 The common thread in the furnishing is the In Between chairs Sami Kallio designed for &Tradition, and that were supplied by Finnish Design Shop’s Contract Sales. It was prohibited to touch the surfaces of the historical buildings, so the furniture had an exceptionally decisive role. “It was clear that the furniture needs to be high-quality and elegant. This is a modern chair that’s also comfortable to sit on,” Suvila says. The design choices were also important in the wine bar. The reflections of Nuura’s Miira 1 pendant lamps take the attention away from the office-like dropped ceiling that could not be adjusted at this point. “Each item creates delight. Nothing is 'just okay'”, Vilja Grotenfelt summarizes. The interior design of Sofia Future Farm adapts according to user needs. According to Suvila, the most challenging part of the design project was the schedule: the interior design was completed four months after the lease was signed. This did not mean that quality had to suffer, explains Grotenfelt, who followed the planning. The design must be flexible also because the spaces will be adjusted according to user needs. “If members say they need something, we will implement it if possible,” Grotenfelt says. The tea salon tables and chairs are now ready for the evening’s event. VM-Carpet’s colorful rugs have been assembled interlocked and on top of each other. This is no coincidence. “Even if everything is thoroughly planned, we wanted the place to feel homey and approachable. This is why we added so much color,” Suvila says.